Like many people, I first took notice of British fragrance house Illuminum when Katherine Middleton chose to wear Illuminum's White Gardenia Petals on the occasion of her wedding to Prince William. At that time, Illuminum's fragrances weren't even available in the United States; over the past year, however, the brand has been making gradual inroads into the American niche fragrance market. Illuminum offers a daunting range of personal fragrances and home fragrances; Tomato Leaf, from the "Haute Perfume" line, is one that has made an impression on me. Illuminum says that "a vegetal freshness is central to this green and pleasing scent," which includes top notes of carrot seed, osmanthus and tomato leaf; heart notes of dew drops, seaweed and water lily; and a base note of musk. (Freesia is also mentioned in a description of the fragrance.) However, after wearing it three or four times, I'd file Tomato Leaf under "misleading names" and "not at all what I expected." It begins with a really unusual blend of mint, ripe peaches and moist green leaves, like a summer salad assembled from ingredients freshly picked in a garden or purchased that morning at a farmers market. I suppose the osmanthus notes contribute to the fruity element, but there's no mention of mint in the official description, so the somewhat mentholated opening took me by surprise. This accord doesn't remind me of anything else I've ever worn. Moreover, it doesn't remind me of tomato leaves, either: it lacks their sun-warmed, lemony-peppery effect. Tomato Leaf loses some of its piquancy as it develops, although it remains fairly interesting. The green notes stay shady rather than bright, and some very quiet white floral notes peek out from time to time. One time I wore the fragrance, I thought I could identify the marine-floral notes of "dew drops" and "water lily," and I was briefly reminded of Kenzo Parfum d'Été as it smelled in the 1990s; another time, I barely noticed the watery hints at all. The musk in the base is woody rather than animalic, and it prolongs the fragrance nicely as a whole. 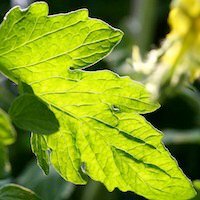 Tomato Leaf has average staying power for an Eau de Parfum and it diffuses pleasantly but not intrusively. It could easily be worn by men or women, especially since its floral notes are so discreet. I don't typically wear many "green" fragrances, but I've enjoyed my sample of Tomato Leaf and I'm still puzzling over its composition a bit (a good thing, since that means it's not just business-as-usual). Illuminum describes this fragrance as "a perfect perfume for anyone who wishes to escape the City," and I agree, since I'm wearing it as I endure the grimy, sticky dregs of another New York summer. However, I still don't understand the name of this fragrance. Something more general like "Greenhouse" or "Trellis" or "Summer Garden" would make more sense to me. If you're really in the mood for a tomato leaf fragrance, you should stick with CB I Hate Perfume's Memory of Kindness or even Diptyque's Eau de Lierre. 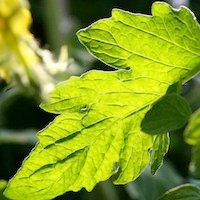 But if you're looking for a new twist on a fruity-green fragrance, you might want to seek out a sample of Tomato Leaf. Illuminum Tomato Leaf is available as 100 ml Eau de Parfum ($225). For purchasing information, see the listing for Illuminum under Perfume Houses. Note: top image [doubled] is Tomato leaf via Wikimedia Commons. I got so excited when I read the title…and so disappointed when I read that it doesn’t really smell like tomato leaf. Thank you for the other recommendations though. Back in 1999 or 2000 I bought a tomato candle at Bath and Body Works that was amazing. It came in a large, square, clear glass container with a round opening at the top and a snap on plastic lid. The inside was clear gel with little red gel cherry tomatoes “floating” in it. They were so cute, they even had green stems on them. I lit it a few times, but it smelled the best when I put it in the window and let the afternoon sun warm it up. It filled the room with an earthy, green, slightly peppery and slightly sweet scent. Unfortunately, I moved several times and have no idea what happened to the candle. Does anyone else remember this line? (There were several scents. Most were fruity, like blackberry and cherry.) If so do you remember the name? I’ve looked for them online, but without the name I haven’t been able to get anywhere with my search. I’ve also tried asking at B&BW, but no one has worked there long enough to remember them. Any help is appreciated. That’s the sad thing about B&BW… *everything* about that place is so short-lived these days! I don’t remember these candles, but perhaps someone else will…! I do seem to recall Votivo offering a Tomato Leaf candle, which might be worth sniffing out. Votivo had a lot of really great “green” garden themed candles. They have been gone for many a year though, and I think the tomato leaf candle you’re remembering was one of them. Yes! I remember that line. Gel candles with little fruits and things in them. So cute. I had a Pearberry candle from that line. It smelled like their Pearberry body products, which at the time were a favorite of mine. I was in high school, so it had to be between 1998-2001. I’ ve never tried any of the Illiminums, but this sounds nice. I love a good tomato leaf- note. My best scents in that cathegory are dkny Woman and Nina Ricci Les belles, the green one. Lovely, lovely mix of tomato leaf and fresh raspberries. Nina Ricci Les Belles! I haven’t sniffed those in a while. Thanks for the tip! Parfums D’Orsay have a tomato leaf themed candle and roomspray and I heard it’s rather good. Oh, nice suggestion. Thank you! Mint, peaches and green leaves sounds lovely. I love peach fragrances but am struggling to think of one that has a green note. I love your image of salad ingredients from the farmers’ market. Bois de jasmin had a post on tomato leaf a few days ago, with a list of perfumes. My favourite is Un Jardin en Mediterranee. Annemarie, thanks! That’s a wonderful list from Suzanna. It’s funny, I went back and tried Un Jardin sur le Nil, thinking that Illuminum Tomato Leaf might bear some greens-and-fruit resemblance, but Un Jardin is sheerer and more watery, without the minty punch of Tomato Leaf. Yes, it’s a great post. I love Nil – just bought a FB in fact – but I don’t get the dense green earthiness of tomato leaf in it. I’d like to try this Illuminum, but Illuminum is not distributed in Australia as far as I know. I echo all of these sentiments. I had kind of dismissed Illuminum after being really underwhelmed by White Petals but this review really made Tomato Leaf a must-sample for me. FF, I was bored by White Gardenia Petals, too. This line seems a bit hit-or-miss to me, but Tomato Leaf was a hit. That sounds really interesting, Jessica! I wonder if anyone knows whether they have a store in London and whether they feature samples there. Hi, Warum — I just took a quick look, and they do appear to have a shop at 41 Dover Street in London. Oh, I love the fragrance to tomato leaves. I haven’t tried any of these, so thanks for the links — but I do enjoy Hilde Soliani’s Stecca. Practicalann, I love the smell of tomato leaves, too. They bring back some childhood memories, and I have potted tomato plants of my own now, so I can go out and sniff the leaves whenever I like! Jessica, lovely description. I seem to remember that Sisley’s Eau de Campagne has a tomato leaf note, and is proably much greener than this. But I like the sound of the Illuminum as I am a sucker for peach. Speaking of which, I am a bit obsessed at the moment with PdN’s L’Eau a la Folie, which I think is perfect for the hot weather – starts off citrussy and green, and ends (for quite a long time) with a gorgeous soft peach (reminiscent to me of the Femme I wore many aeons ago). Jillie, you can’t go wrong with Parfums de Nicolai, right? I still need to try this one! A gorgeous tomato leaf is Stecca from Hilde Soliani. I think it is blended with jasmine, and it does turn a little sweet as it progresses but the tomato is quite apparent. Also Piment Brulant has tomato leaf in it, giving it an odd green note alongside the hot chillie and chocolate! But it works! Piment Brulant!! I remember falling for that one in the L’Artisan Parfumeur boutique on Thompson Street in NYC (now closed, alas). When people talk about tomato leaf, I always feel obligated to put in a plug for the wonderful, not-loved-enough CdG Harissa. Sooooo good. SS, You know, I still feel as though I haven’t tried all the fragrances put out by CdG!